Hidden behind these dead walls and enclosed façade is a modern three-bedroom house for luxurious living and relaxed outdoor entertainment. 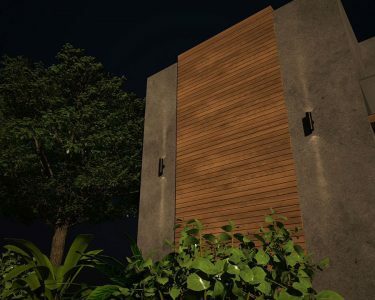 Crafted out of natural wood and concrete creates an impression of harmony between the house and the nature itself. 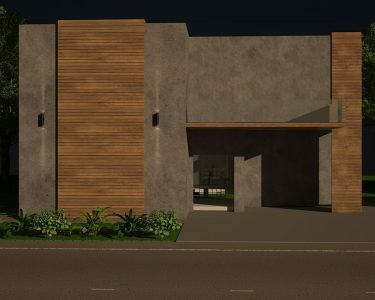 Small and large openings with open spaces in individual buildings and old warehouses have great potential, and the 4500 square feet house has been commissioned by such a project. For zones that are unbounded in open space, the space designers have planned to move the natural light as far as possible, by providing a courtyard right in the middle of the house, completely opened to sky, and the dividing partition walls are constructed with bricks and glass. The arrangement of living spaces around a large, open courtyard helps bring the natural light into the house. The courtyard caters for both work and relaxation, andfunctions as an outdoor room onto which all internal areas flow – perfect for winter entertainment, designed to withstand the weather conditions the Pakistan has to offer. In the color palette, warm and light shades enhance energy and promote relaxation. The wall surfaces are painted in white, wooden floor and ceilings combined with white kitchen and light wood. The use of natural materials and other surfaces with variety of natural colors create a pleasant, natural color finish.At the ground floor level, we have all the living areas at one place.Along the courtyard there is a community area, kitchen, dining, and drawing room, all connected to each other with a seven feet wide lobby moving around the central courtyard. On the other hand, at first floor level, we have all the private areas, a bridge connects all the bedrooms, ends at a terrace atwest side of the house. Beautiful, high quality materials and tiles make the house modern with modern lines. 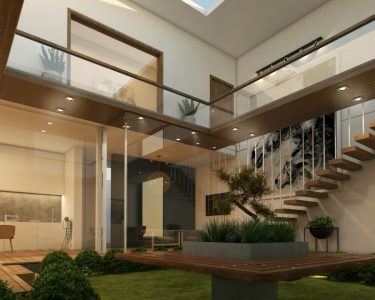 This project was designed by Archi-cubes, an Architecture Firm, having Best Architects in Lahore. From its planning to its execution everything was done by a team of Architects and an Interior Designer. We give a touch of elegance to each project with sophistication and proper price.